Harmonic Second Interval - Why is it different? Why is writing a Harmonic Second Interval different than writing any other harmonic interval? Why do the notes of a Harmonic Second Interval have to be touching? When writing a Harmonic Second Interval, does it matter which note is written first? Yes, yes it does. I want to share the answers to these questions with a great Memory Jogger and 2 UMT Tips to help your students (and you) remember who’s on the left and what is right! First, let's begin with how to write a whole note. A Whole Note is written as a circle. Printed music uses a Musical Font which gives a whole note a fancy “shaded” effect. When a student writes a whole note, they do not need to be fancy! They can simply draw a circle. 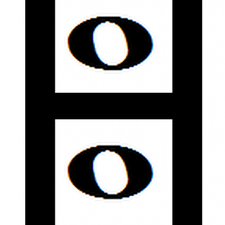 A Harmonic Interval is written one note ABOVE the other (together). Both notes are played at the same time (together). The Memory Jogger for a Harmonic Interval is the letter H with one note written above the other. We call this Memory Jogger the Harmony Hotel. Harmonic Interval at the Harmony Hotel is one note/room above the other. The Harmonic Second Interval is a little different. A Harmonic Second Interval is different than writing any other harmonic interval because a Harmonic Second Interval cannot be written one note above the other as it looks, well, “smushy” (yes, a new musical term…*grin*). The notes of a Harmonic Second Interval have to be touching because they need to be played together, at the same time. The note that has the lower pitch (sound) is written as the note on the left. The note that has the higher pitch is written on the right. A Harmonic Second must be written one note beside the other, touching. If the lower line note is on a ledger line, the upper space note will share the same ledger line. The ledger line will be extended so that only one ledger line is used for the harmonic second interval. If the lower note is in the space, the ledger line for the upper line note does not need to extend across the top of the space note. It only needs to extend for the length of the line note itself. Check out Prep 1 Rudiments page 15 for more UMT Tips on writing Ledger Lines! And, yes, I know that we all “know” these rules. But in my case, I spent years “second guessing” myself and hoping that I was right when I was teaching a Harmonic Second Interval using whole notes or when writing a Harmonic Second Interval using ledger lines. So much of my early teaching years was spent teaching with my fingers crossed, hoping and assuming that I was teaching a theory or pedagogy concept correctly. By sharing these UMT Tips, ones that I questioned myself on, I hope that other teachers will save themselves from teaching with their fingers crossed! If you want to develop a stronger foundation in theory, to fill in your own gaps in your theoretic foundation, I strongly recommend that you buy the Ultimate Music Theory Complete Rudiments Workbook and Answer Book now. Work through the Workbook. Answer every question. Mark your own work. And enjoy the feeling of confidence as you no longer assume that you are doing it correctly. No more teaching with your fingers crossed! During my years of teaching, I probably second-guessed myself on just about every theoretic and pedagogic concept out there! I spent years teaching theory with my fingers crossed… until I started using the Ultimate Music Theory Workbooks! P.S. Join the Conversation – Have you ever had a theoretic concept that you have assumed is correct and you just want to make sure it is correct? Share it below. I guarantee that you are not alone! 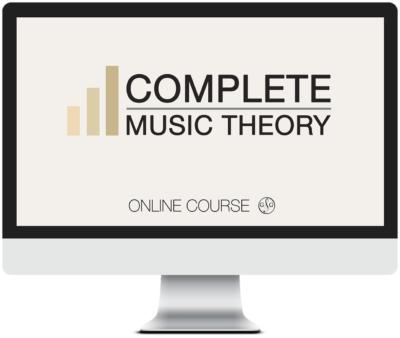 Complete Music Theory Online Course includes: 24 Step-by-Step Video Sessions and Online Support with Exam Marking & Certificate! I am SO thankful for this Ultimate Music Theory curriculum! I began using this series with almost-beginning students this year! (I wish I had used this with others who I feel are struggling with another method – I will be assessing changes!!!) It is amazing how much better their note recognition, timing and other skills have increased! In the past I encouraged used flashcards which students probably did not use. However, with the addition of the Prep 1 and 2 levels I am seeing HUGE changes in my students – and the only thing I’ve added is this method of theory! Even my adults are eager to complete the work (sometimes a unit at a sitting!!!) – two of them have completed the two prep books in record time and have gotten nearly 100% at every testing. The UMT test that I gave upon completion of those two books showed me they have understood the concepts – one student missed 1/2 a point! and the other is taking the test this week. P.S. I was only going to write a Thank-you to include with the notifications – it kind of went on to sing your praises … Blessings, Glory and Shelagh! Thank you, Glory, for helping music teachers and students stay informed! There is much inconsistency and misinformation with writing music. Having a music degree can help. Even then, there is always forgetting what has been learned or not learning accurately. Transfer students to me from other “music teachers” reveal this fact.” With a Smile and a Song!” needs to be in every music teacher’s arsenal of referral material!